Birds are experts at stopping. 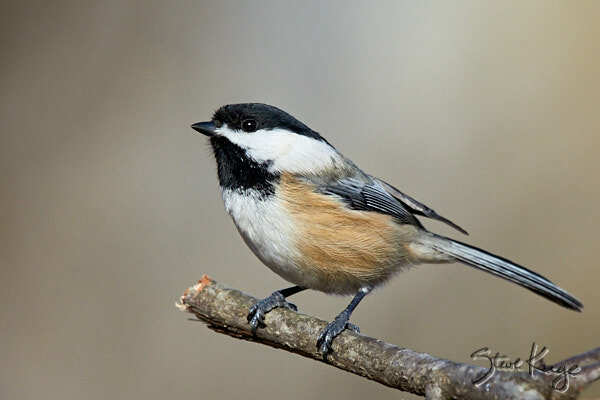 Even the most active birds, such as this Black-capped Chickadee, will stop. So what do birds do when they stop? And they do nothing, which for a bird is really nothing. There’s a message here for us: We need to practice stopping. Because life is not a hamster-wheel contest that you win by running faster. Instead, life is an experience. More so, it’s an experience that reflects your choices. So true success comes from making good choices every day. By the way, humans are designed to make good choices based on compassion for all. That’s because good choices are essential for survival: Happy people perform better, live longer, and contribute more to the future of humanity. The point is: You will make better choices when you: a) Rest, b) Consider consequences, and c) Act for the greatest good. In contrast, you will make terrible choices when you rush, act frightened, or feel desperate. And that is why this matters. When you stop, you can reflect. Then you can review and prioritize your options. For example, you might take a second to focus. Or stop for a minute to rest. Or stop for an hour to read. You’ll find that this helps you feel better about your day. So true! And with that, I will now take a break and read for an hour! Your posts always come at the perfect time. Taking a stop break now, even if for a few minutes.